"Should you do that? You're a journalist! Aren't you supposed to be impartial?" "You should really use your influence wisely. What if you affect the outcome of the vote?" "Don't you think that's risky? I mean won't it get you into trouble?" I find these responses fascinating as it says far more about how others view me as opposed to how I view myself. I am not a journalist and have never claimed to be - I am an opinionated blogger. I often espouse opinions about various issues, and I am unsure why politics should be much different. The comment about influence always makes me giggle as I believe any influence I have is negligible and just as likely to sway people the other way. If my comments affect the outcome of the vote in any way I hope they simply increase the voter participation above our current abysmal rates. And as for it being risky? Well, playing it safe in life isn't much fun, not really my style and frankly I am a resident, citizen and voter who has every right to hold - and express - her opinion. By this preamble you have probably guessed I am going to reveal who I plan to vote for in the upcoming federal by-election. For most who know me this will come as no surprise as they know my political leanings and thoughts. Remember during the Twilight heyday when everyone was either "Team Jacob" or "Team Edward"? Well, I have begun thinking of this election in this way and some time ago I picked my team...and it is Team Kyle. 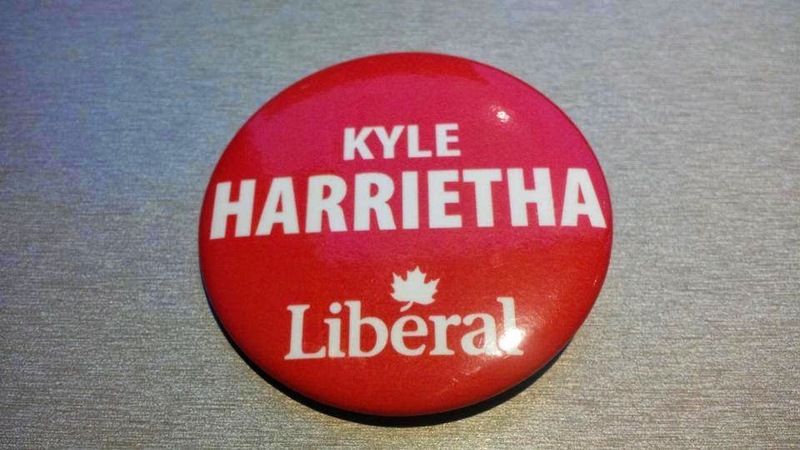 When the time comes to mark my ballot I will be marking my x beside the name of Kyle Harrietha, Liberal Party of Canada candidate. There are many reasons for this decision, from having worked closely with Kyle on a political campaign a couple of years ago and knowing his intelligence and understanding of the political scene to having a deep respect for his ability to navigate political waters. Some of the reason is the belief that the definition of insanity is doing the same thing over and over again and expecting different results, which is what we have been doing in this region for decades as we elect Conservative candidate after Conservative candidate and receive the same sort of dismal representation. Frankly our last representative seemed to spend his time devising vanity crossword puzzles and then mailing them out to thousands of households at our expense (check out this story if you want to be outraged, as while your home delivery service is being cut our political representatives in Ottawa can continue to send us tree-killing, self-aggrandizing mail at "no cost" except of course the cost is still being born by all of us who pay taxes to support Canada Post). I saw a photo on Twitter of David Yurdiga's team covering up old Brian Jean signs with his new ones and the heavy symbolism was not lost on me, as while Yurdiga might well be a different person, a good man and even a good candidate I cannot in good conscience vote for any indication that we will receive more of the same neglect we have seen under the current Conservative government. This is no indictment of Yurdiga as an individual but rather of a party that I believe has failed to meet the needs of this region, and in a most woeful way. Some of the reason is which party leader has come to our region during this time. So far Justin Trudeau has been here twice, meeting with voters and hearing their concerns, travelling the region to support Kyle. I have had the opportunity to speak with him and been deeply impressed each time. Harper and Mulcair? Well, Mulcair was going to come but had a change of plans, and Harper seems to be a total no-show. Whether or not your party leader bothers to show up in a riding during a by-election does matter, regardless of how busy that leader happens to be, and especially when we are talking about a region that contributes to the national economy in the way we do. Now, we happen to have a party leader who lives right here in Tim Moen of the Libertarian Party, which is a reason for some pride. Some of the reason is an evaluation of the individual candidates. I happen to like Tim Moen a great deal, and while I admire and respect his intelligence our political views are quite divergent and thus I cannot support him politically, although I certainly do in a personal sense. I have not met Lori McDaniels of the NDP, but I have trepidations about the NDP stance on oil sands development and what that could mean for this region. I don't know David Yurdiga well but I am quite familiar with the Conservative track record in the region (or lack of one in my eyes) and I know I cannot continue to support that direction. And so here I am at Team Kyle. I have been here for some time already, but what I want to make clear is that I am not asking you to join me or to vote the way I do. I am asking you to respect my choice and to simply do one thing: vote. Vote for your team, the one that best matches your beliefs and opinions. Support the candidate you believe to be the correct one for our region. But most importantly just VOTE and don't let others determine the outcome, even people like me who have a platform to share their opinion and preference. And don't be afraid to share your own, to say who you are voting for and why, because you have every right to shout it from the rooftops if you see fit. Just remember that you can do so in a way that is respectful of the rights - and choices - of others. So choose a team, whether it is Team Kyle, Team David, Team Tim or Team Lori. Share with others why you have chosen them, and then get out the votes - yours, your family's, your friends. Use your voice and direct the future of this region, because your vote is your voice, and every single one matters. Soon it will be time to choose your federal team.